Flora McLachlan studied art at Brighton Colledge and went on to complete an MA in English Literature at Brasnose College, Oxford. 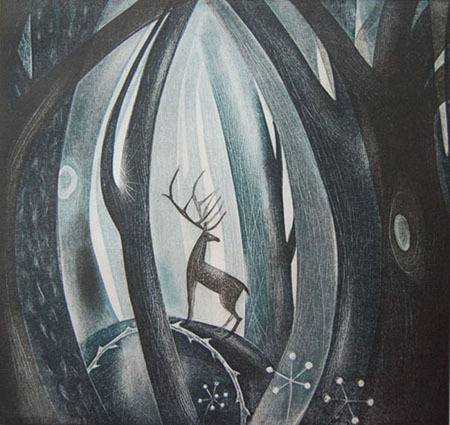 She has exhibited throughout the UK, including at the Royal Academy Summer Exhibition in 2005, at Glyndebourne and at the Mall Galleries, London. She writes: "My pictures are records of things seen and imagined by twilight or moonglow. I take inspiration from my studies of English literature, myth and legend. I try to express a sense of the enchantment I feel is embedded in our ancient landscape. I try to imagine the secret face of the land, when the light fades and the creatures come out to roam. 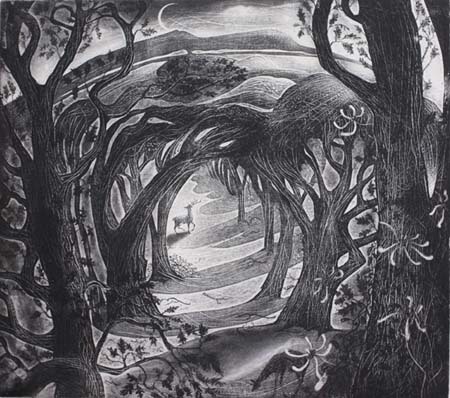 I’m feeling for a lost or hidden magic, a glimpse through trees of the white hart. My preferred technique is etching. I love its atmosphere, the deep mysterious blacks and the glowing whites. During the long etching process, my original idea changes, and grows, with the working of the metal. The act of creation continues with the printing of the image; many of my etchings are underprinted with a painterly mono-collagraph plate, and most are complex and demand a concentrated and meditative approach to the inking and printing."